It will be easier to remove dirt and debris to a concrete floor that has been sealed. However, you should not seal your floors while dirt or grime remains on the surface or ground into the floor. 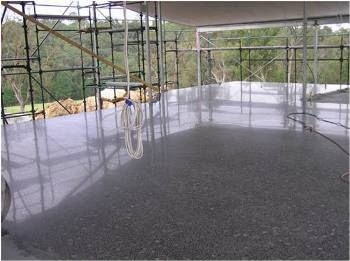 Polished concrete is often more resistant to ground in dirt. A light sweeping with a dust mop followed by wet mopping will keep it clean and shining. A microfiber dust mop is ideal for this type of floor. Without daily dust mopping, the fine particles will cause damage to the surface of your floor. You may use a hard surface vacuum in place of the dust mop on your polished concrete floors. To clean dirt from your concrete floor, start with a soft brush and water. If dirt or stains remain, add mild soap to your solution. Move to a stronger soap if the dirt persists. A harsher method of cleaning concrete floors involves using soap, water and ammonia. However, you should only use this method after exhausting other methods, and ammonia can damage a concrete floor that has wax layers over the sealant. You do not have to use specialized cleaners, but you should look for a solution that has a neutral pH and combine it with cool water when mopping your floor. Specialized cleaners can help to repel dirt from your concrete floors after you clean them. Older concrete floors can return to their polished appearance with a gentle buffing. Avoid cleaners that include "solvents," which can cause a peeling effect on the wax of your concrete floors. Furthermore, bleach, vinegar and cleaners such as Pine Sol are not good for your floors. If you find that your floor is sticky after mopping, re-mop with water only. Using too much soap can result in this stickiness. Just like other hard materials, concrete is susceptible to scratches and scruffs from moving furniture. If you cannot move a piece on a wheeled cart, consider felt or plastic guides for moving furniture. It's smart to use floor protectors beneath your furniture even when you're not moving that furniture. This can also reduce the noise that occurs when you move chairs around the room. Avoid plastic-backed mats or furniture with plastic feet. Plastic can combine with the sealant that you used on your floor and cause damage to your floor when you move the mat or furniture. However, you should use mats to remove dirt and debris from your shoes that can damage your flooring. Once or twice a year, you'll want to refinish your concrete floors because the top coat breaks down over time. Polishes such as Thoroughbred can be applied with a foam applicator.